Initially I had a parenting punchline figured out for this week but then my daughter mispronounced something that instantly inspired me. The storyboard sequence in my head came pretty naturally so I just had to ink it! The tricky part was finding time between keeping a preschooler and newborn twins alive, commenting on every funny facebook post i came across, picking up dog poop and holding the fort as my husband was out of town. Oh and I threw a birthday party this week for the preschooler that involved Ariel and DQ ice cream cake. I don’t say this to boast but hopefully to demonstrate my commitment to my craft. Life is busy, so very busy but I am committed to meeting my self-imposed Friday deadlines. Anyway, back to the punchline. After the mispronunciation gaffe, I googled if buzzing insects closely resemble any musical notes. Apparently they buzz closest to the key of F, which I found neat! 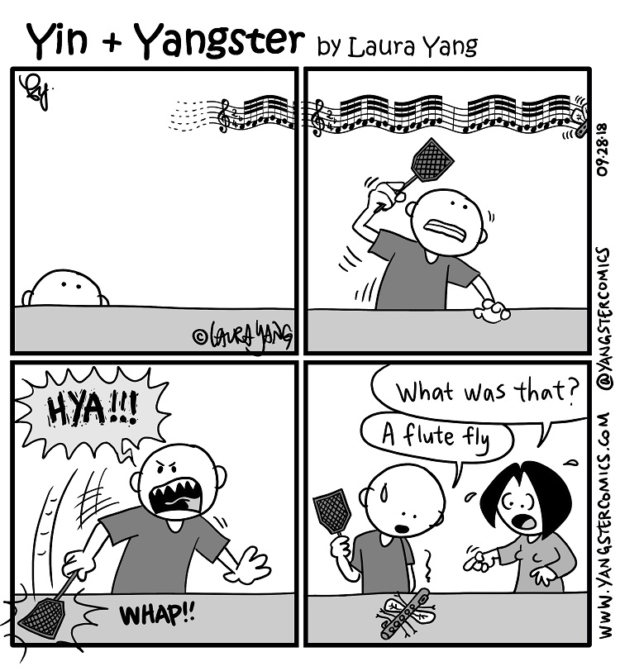 I figured the type of fly illustrated in my comic would be buzzing by way of a trill… My brain is toast. It’s 2:24am. I’m not sure if I’m even being coherent at all. I shall bid thee goodnight.